With the future of the Trans Mountain expansion project in limbo, another major pipeline project is awaiting a do-or-die decision by regulators in Minnesota, with a key report on the future of Enbridge's Line 3 expected today. 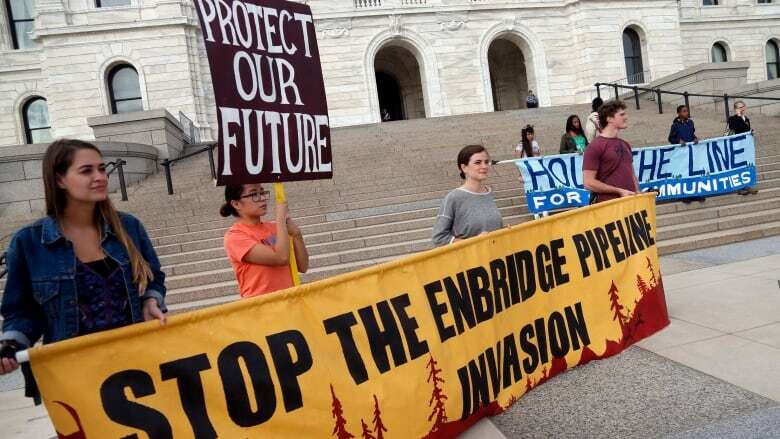 With the future of the Trans Mountain pipeline expansion project still in limbo, another major pipeline project is awaiting a do-or-die decision by regulators in Minnesota, with a key report on the future of Enbridge's Line 3 expected today. The federal cabinet gave the green light to both Trans Mountain and Line 3 — the largest project in the history of Enbridge — on the same day in November 2016. And while work on Line 3 has already started on the Canadian side of the border, the regulatory agency tasked with approving construction through Minnesota has so far held off granting necessary permissions amid intense local opposition. If Enbridge fails to secure a state permit and route approval, Line 3 could join the list of other major natural resources projects approved by Prime Minister Justin Trudeau that have failed to launch. 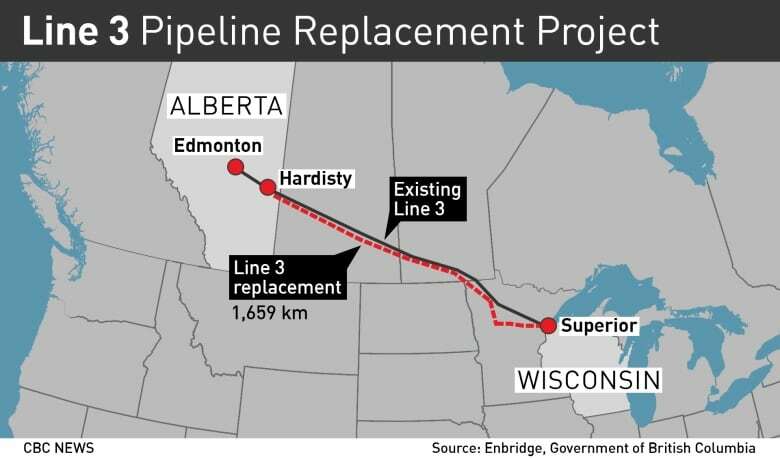 Enbridge hopes to replace the entire span of the aging pipeline, which carries oil from a terminal near Hardisty, Alta., through northern Minnesota to Superior, Wis., where it travels on to U.S. refineries for upgrading. The project would nearly double the pipeline's current volume to 760,000 barrels a day. The existing line, constructed in the 1960s, has been a source of spills in the past. The company has voluntarily dialled back capacity to address mounting maintenance issues while it pushes ahead with a replacement. "All the Line 3 approvals are place in Canada, construction has already begun in Alberta and Saskatchewan, and it's about to begin in Manitoba. I know there's one more regulatory hurdle we're expecting from Minnesota, so, that's all I can say," Natural Resources Minister Jim Carr said Monday. Enbridge, a company that has seen its stock sink nearly 40 per cent in the last year over uncertainty in the energy sector, has been unwilling to leave the project's future to fate. In 2017, it spent over $5.3 million U.S. on lobbying efforts in Minnesota — nearly five times more than any other company or interest group spent advocating for any cause in that state in the last calendar year, according to a review of the state lobbying database by CBC News. Just over $5 million of that sum was spent lobbying the Minnesota Public Utilities Commission (PUC), the agency that regulates electricity, energy and telecom interests. A spokesperson for Enbridge said the lobbying expenses "increased largely due to the intensity of the regulatory process for the Line 3 Replacement Project ... [which] included participating in 22 Department of Commerce draft Environmental Impact Statement public meetings, supporting 18 public hearings, three weeks of evidentiary hearings and multiple appearances in front of the [PUC]." As the fractious debate continues, the Democrat-controlled PUC has appointed an administrative law judge to draft a report on the necessity — and the desirability — of approving construction and the proposed route. Judge Ann O'Reilly will deliver that report today, CBC News has confirmed. A negative opinion from her could spell trouble for the energy infrastructure giant behind the project. The PUC leans heavily on the opinion of an administrative judge when making a final decision, which in this case is expected by June. O'Reilly previously pushed forward the deadline for delivering her report on the "complex" project, a move that angered supporters of Line 3 who accused her of foot-dragging. Like Trans Mountain, Line 3 has faced entrenched opposition from some Indigenous groups and environmentalists who fear a leak of diluted bitumen could wreak havoc on one of the state's many lakes. And in a state with the motto "Land of 10,000 Lakes," such a threat has locals fearing approval of the $7.5 billion project could be disastrous because the proposed route passes through sensitive ecological areas. The Minnesota Department of Commerce already has recommended against approving the project — and has even suggested the existing line should be shut down entirely. "We really see the building of a pipeline that increases the capacity for tar sands oil, the most carbon-intensive and polluting form of oil, as just not necessary, and it runs contrary to the interests of the people of Minnesota and the direction we're going with our energy policy, with our environmental policy," Leili Fatehi, a lawyer representing the Sierra Club in the Line 3 proceedings, said in an interview with CBC News. "It's going to affect some of our most sensitive environmental resources ... This is a fundamental step in the wrong direction." Fatehi said that while O'Reilly's report is not binding on the utility review panel, if the judge comes out strongly against the project it could force the PUC's hand, leading it to deny construction permits to avoid litigation. "Agencies will usually agree with the decision of a judge. They will give a considerable consideration to their advice," she said. The project is not without its defenders in the state. One of them is an umbrella group representing business and labour interests called "Jobs for Minnesotans," which touts job creation — and the roughly $20 million in annual property taxes municipalities could collect — as reason enough to support construction. "We'll be waiting on pins and needles," Nancy Norr, a co-founder of Jobs for Minnesotans, said in an interview with CBC News. "The preponderance of evidence would suggest [O'Reilly's] report should be positive. "We see this as a triple bottom line win for the state of Minnesota. We have the direct economic impact of over 6,500 jobs. We have the long-term economic benefits of tax revenue to our local units of government and we have an environmental win in terms of replacing an aging line with a much safer pipeline." Norr said Minnesota does not produce any oil of its own and is dependent on Canadian oil moved by Enbridge, which is upgraded at local refineries like the Koch Industries-owned Pine Bend Refinery. That facility supplies about half of the state's motor fuels — something Norr maintains the Department of Commerce overlooked when recommending against the project. 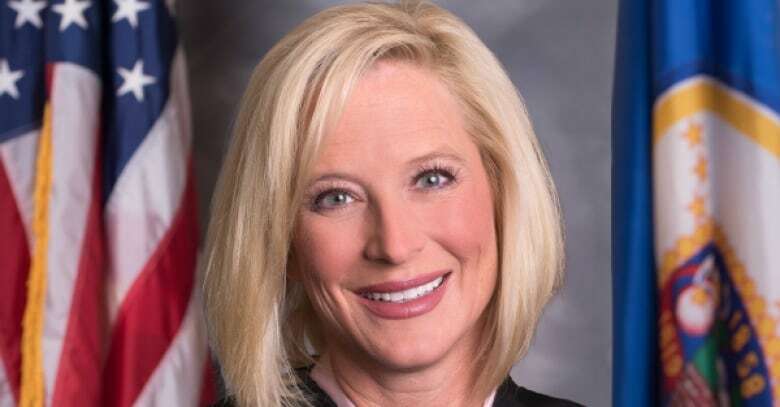 "Even though we're a state that is very much in the process of moving forward with a renewable energy economy, in our view, there needs to be a balance of course to ensure we still have reliable supplies of both electricity and transportation fuel," she said. "We consider Canada to be a very friendly source, an important trading partner."